"Add 10"" Sod Cloth? (add $67)"
A beautiful round pavilion with two doorways for better ventilation. The Carousel comes complete with a sleeved center pole, spokes, stakes, and wind ropes. 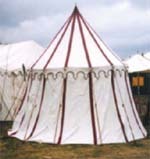 This tent is generally made in one piece with attached walls, but detachable walls with D-rings and snaps are available for an additional $65.00. You'll find that it is much easier to set up with detachable walls because there is less bulk to deal with. Shape fitted floors are also available. Made out of Sunforger canvas for minimum shrinkage, and they serve as a rough pattern for where to drive your stakes for set-up. These are also available in the Super Ground Cloth design. Painted roof and walls seams are available in any of the acrylic paint colors shown below.